In the winter of 1974, the all girl band Vixen began to experience artistic differences -half of the members leaning toward a fairly conservative stage style. The other half, more bold, embraced the chance to expand their horizons and moved to Rapid City, South Dakota, adding lead guitar and bass to form Wild Cherry. 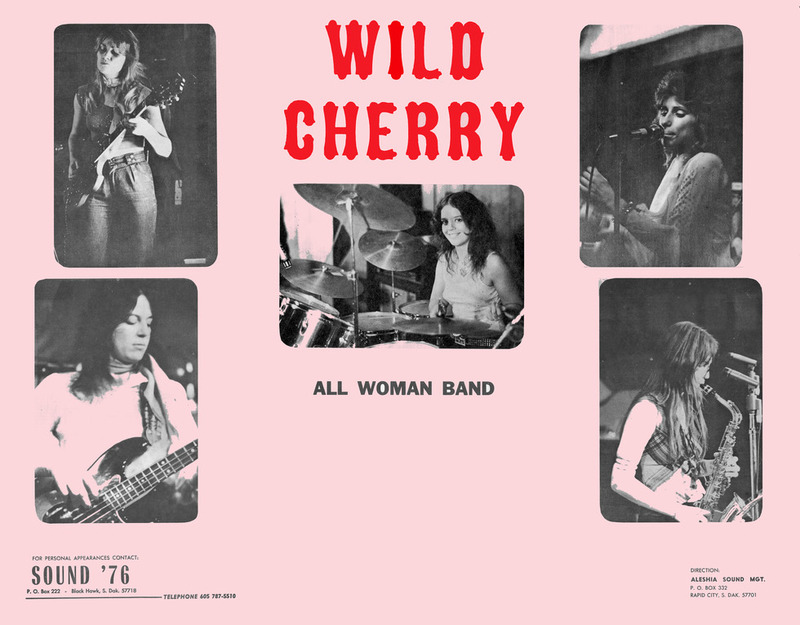 In 1974, Wild Cherry was one of less than eight known touring “all girl bands” in the promoter Kim Fowley who was also looking for female musicians. Fowley would call Wild Cherry’s manager from time to time looking for guitar and bass players. It was a special time, Wild Cherry, along with the Runaways, were at the forefront of women coming to modern rock & roll. On August 7, 1974 in Pierre, SD, the band played their first date as the headliner for a 25 date summer concert series in South Dakota, Nebraska and Wyoming. In the early years, Wild Cherry played the major clubs, ballrooms and colleges in South & North Dakota, Wyoming, Montana and Minnesota, with an emphasis on the clubs that lined the borders from Sioux Falls to Grand Forks. Later on, the clubs and ballrooms of western Iowa were added. One favorite club the Casino Vale in Vale, Colorado. It was a challenging club as it mainly featured recording artists and was over 10,000 feet in altitude, making performances difficult from the lack of oxygen. The Station House in Aberdeen and Miner’s Camp in Rapid City were favorite venues that were played at regularly.